The BBC introduced BBC Taster, a space to develop its latest ideas for digital content and emerging technology. Taster will feature early and experimental concepts from across TV, Radio and Online, enabling the BBC to explore the future of content with audiences and offer them something completely new to try, rate and share. Taster is a place for the BBC to try new ways of telling stories, develop new talent, and put new technology through its paces. It also allows the BBC to showcase a range of editorial and technology projects that may have previously remained behind closed doors. 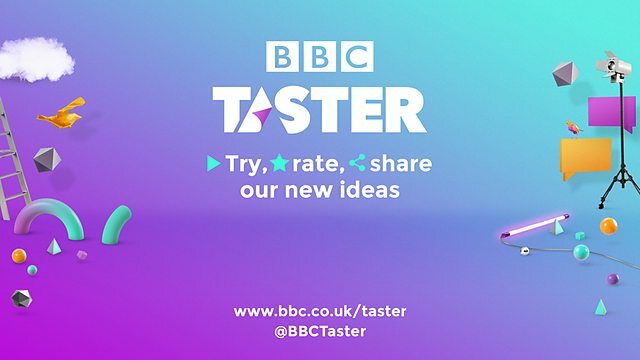 Taster enables the BBC to release its ideas early, get direct feedback from audiences and improve them if we see potential. More ideas will be regularly introduced into Taster and could come from anywhere across the organisation – from TV and Radio production, to our technology experts in BBC Future Media and our digital innovation team. This ensures greater collaboration across the BBC and with the wider industry, enabling us to innovate quickly and work on a range of ideas in response to audiences’ rapidly changing media habits. For example, the devices audiences use are proliferating, with tablets now in 44 per ent of UK households, and 61 per cent of UK adults own a smartphone – including 88 per cent of 16 to 24 year-olds – and are also considered the most important device for accessing the internet among 16 to 34 year-olds. (1) And BBC Online now receives as much traffic from mobiles as it does from PCs. (2) Social media also plays an increasingly important role among youth audiences, with 75 per cent of 16-24 year-olds in the UK claiming to use social networking sites. There will be a mix of content developed specifically to explore the potential of new formats and digital technologies across a range of genres. At launch, BBC Taster features examples from BBC iPlayer, News, Radio 1, Natural History, Drama, Current Affairs and Arts… with much more to come in future. It’s also an opportunity to serve audiences something extra, utilising the BBC archive, additional and unseen material from BBC recordings or backstage footage. When Len Met Jen: The full interview with Lena Dunham and Jennifer Saunders, as seen on Newsnight, made interactive. Features 40 minutes of unseen material.Who is in today? Lets audiences know which celebrities visited BBC studios and offices that day, offering exclusive photos, videos and backstage gossip. Simon Reeve’s World Tour: Ahead of his upcoming BBC Two series, Simon brings us an interactive world tour, combining archive material and exclusive footage. BBC iPlayer Shuffle: A continuous video player that learns from what you click on, serving relevant content to you as it figures out what you like, and what you don’t like. Run the Jewels: Exclusive and interactive material from highly acclaimed American hip hop duo Run the Jewels’ recent gig at Koko, including backstage footage and interviews. Body language: Five poets have written three different stanzas about different parts of their body. The user can then mix and match images and poetry to make their own videos and pictures and share with friends, with up to 125 possible combinations. Your Story: Uses the BBC News archive to create a personalised and shareable timeline of the big, funny or quirky stories making the headlines from when you were born. Radio 1 R1OT: Brings a competitive element to online voting and will influence what happens on air. Tune in to BBC Radio 1 for the first R1OT taking place soon. KneeJerk: New comedy talent The Noise Next Door turn social media platforms into a comedy stage.